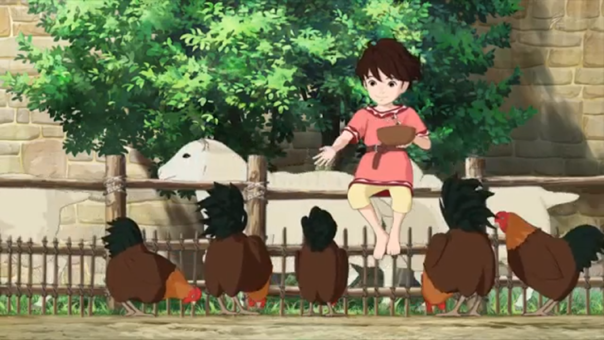 Sanzoku no Musume Ronja is an adaptation of Swedish author Astrid Anna Emilia Lindgren’s tale of a bandit king’s daughter who grows up in a magical forest. 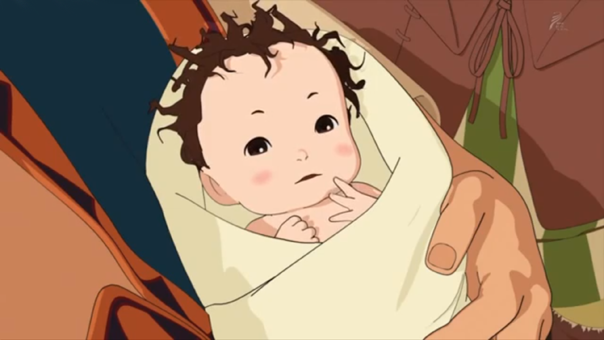 The series was developed by Studio Ghibli, though that may not be totally obvious, because everything except the backgrounds is cel-shading style CGI. Studio Ghibli has certainly dabbled with CGI elements in the past, and their expertise with detail, lovingly rendered animals and warm, childlike colors all shine through. I found their take on anime-style hair in 3D especially respectable. However, the over all result is jarring, simultaneously too fluid and too robotic. It’s… kinda unpleasant to look at, if I’m honest. 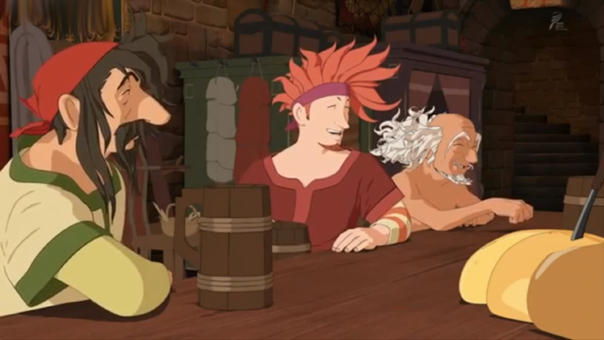 Where most anime is uniform and the people and their expressions are purely place holders for our own projection, Ronja’s overly-diverse looking characters with typical anime expressions cause a disconnect. I’m speculating here, but that’s my gut tells me. At least the aesthetic is fairly consistent. There’s a handmade quality to everything and a blend of Viking and Princess Mononoke that all gels in a believable, medieval way. That said, this realistic approach also makes Ronja jarring when less believable things happen. Ronja’s mom, Lovis, is by far the best character. Her deadpan timing and annoyance with the rest of the cast is spot on! This double premiere takes us from little Ronja’s birth during a lightning storm to the day she leaves on her first unsupervised trip to the forest. We start off in Mattis’ perspective, sorta. 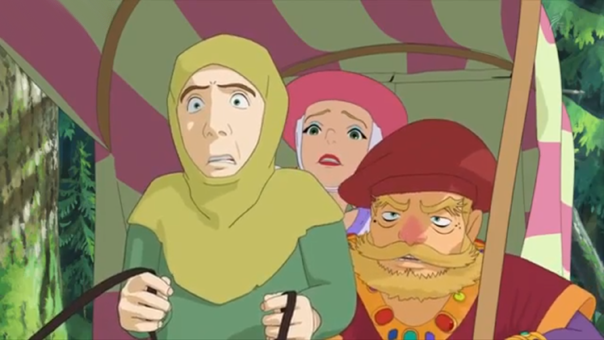 He’s the leader of a bandit tribe who live in a castle, deep in a forest. He and his many men are quirky but kind, and generally happy. Above all else, they are excited that a Mattis’ wife has a baby on the way. 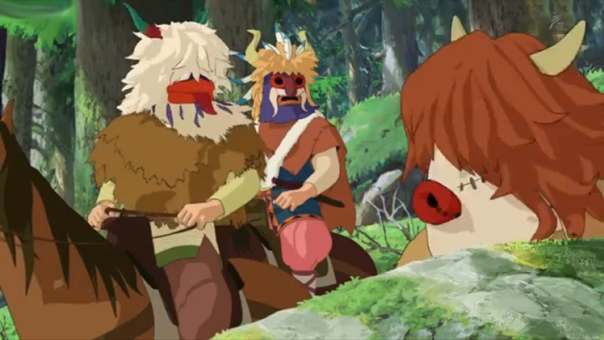 The bandits wear monster costumes to frighten their targets. This seems largely unnecessary, since the bandits are able to take out three armed knights via “rope attacks” before anyone has any idea what is going on. In a clever twist, we learn the forest really is home to magical creatures. I say clever, because dressing in costumes put me in a non-fantasy mindset and so I just assumed that Lovis was annoyed at shrieking hawks outside her castle window. 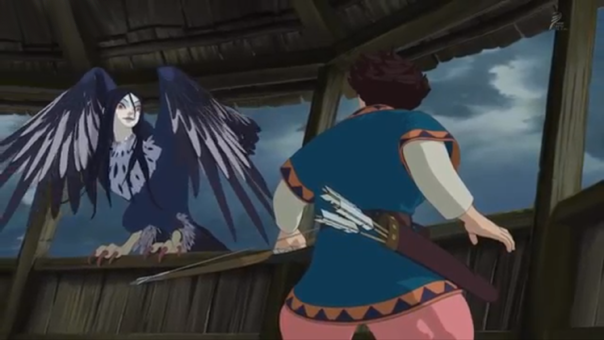 The harpies are the best drawn element of the show and their scenes, while ultimately without purpose, have great angles. Later, during the happy party that follows Ronja’s birth, lightning strikes the castle and apparently is able to blast through 80 feet of rock. In fact, the damage is so serious that we see the castle remain ‘split in two’ for the rest of the show. Here’s where the show starts to lose me. Despite being rendered in a way that should make everything feel more real, the show’s totally un-grounded, happy-go-lucky weirdness makes it feel the opposite. There’s just no weight to anything. No conflict. Ronja just feels so…insubstantial. During the next ambush, we see what appears to be two horse-drawn carts with no guards moving through the forest. Again, this is from Mattis’ point of view and everything about his expression and how it looks like guards could be hidden from view in the rear of the carts, made me expect a trap. Possibly even a sudden tragic loss of Mattis to shape Ronja’s childhood. Nope. Mattis is distracted because he wants to feed Ronja rice pudding and his men want to watch. So they abandon the raid and rush back to the castle. I can see how that should be funny, but it just misses and comes off weird. Ronja eats her first porridge, unless she’s had it before and its not as special an event as Mattis is making it out to be. Then, for the first time we see from Ronja’s perspective. She imagines the dancing men are frolicking lambs. She crawls around a bit then gets tossed into the air by a happy Mattis. Then she transitions into being an older child and is being tossed still. Its a simple transition and it makes her childhood clear: it was full of song and dance and cheer. she has every right to be the happy dancing acrobat child she appears to have become. 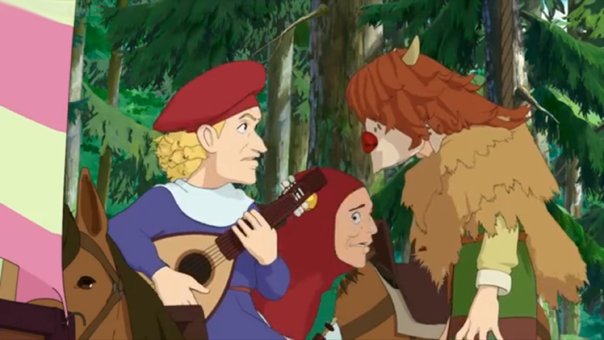 The final act is dedicated to Ronja’s first day being allowed to leave the castle and enter the surrounding forest on her own. It’s really still about her dad and his coming to terms with it being time to let her grow up. It’s not really about the forest. She just sees it in the distance and runs toward it before then the credits roll. I honestly have no idea what to rate this show. Ronja is the third show this season that’s definitely not intended for me as an audience. However, unlike World Trigger and Joker, Ronja has a lot more serious artistic thought put into it. It feels like an 8 but a very weird one that I don’t have any interest in watching. Oh Well? We’ll see what Preston thinks, when she has a chance to start reviewing it next week. For now? 8 it is. With a hi-tech sci-fi show like Arpeggio of Blue Steel or Knights of Sidonia, cel-shaded CGI characters work just fine. 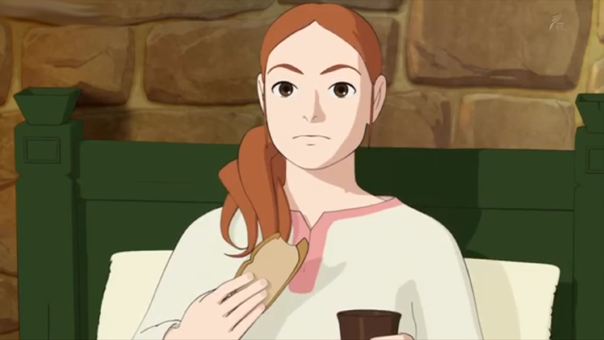 But I think that look clashes with the far more natural and medieval setting of Ronja. That said, while it was jarring at first, I got used to it, and even came to see it as part of the show’s charm. Then I got to the end credits which showed beautiful hand-drawn concept art of the characters, and it made me wish this was animated like a typical Ghibli film all over again. If it had been, it would have meant a sure 9 across the board. Because there is a lot to like here. Sure some moments were syrupy, even cloyingly sweet and cute, but there’s a sturdy, profound dignity and earnestness to the storytelling that drew us further and further in as Ronja grew up. Perhaps the most moving moment of the double episode was Mattis imagining Ronja falling down a pit. Like him, we’d been with Ronja since her birth, and while yes, her growth was accelerated, a great amount of time and care was spent to make us care about and treasure Ronja as much as much as Mattis and the gang. In that moment of theoretical tragedy, my stomach sank and tears came to my eyes as well! 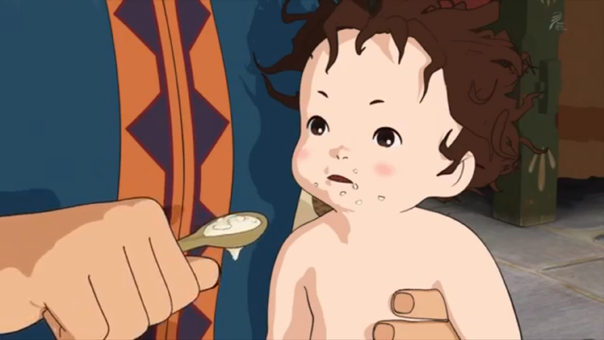 But while she’s wee, Ronja was raised to be strong and hardy by strong and hardy folk; including one badass Mama in Lovis (Ghibli can always be called upon to give us compelling, powerful female characters not defined only by their relations to men). Ronja’s going to be jsut fine. After all, seeing the grand forest sprawling out before her is no cause for worry, but for the same elation and excitement surging through Ronja, as her world suddenly increases in size a hundred fold. I for one can’t wait to see how she fares.